Internal communications is imperative for all businesses, far and wide – even as far as the land down under. Australia’s Momentum Energy knew this importance, but wanted to change how they were communicating to their 10,000+ employees. Like many businesses, they wanted to make the switch from paper to digital screens for their internal communications, and approached CrownTV for help. In addition to reducing paper waste and clutter, Momentum has experienced more informed, engaged staff and better content since implementing digital signage. Momentum Energy is a 100% Australian owned and operated energy retailer, retailing electricity in Victoria, New South Wales, South Australia, Queensland, the ACT and the Bass Strait Islands. 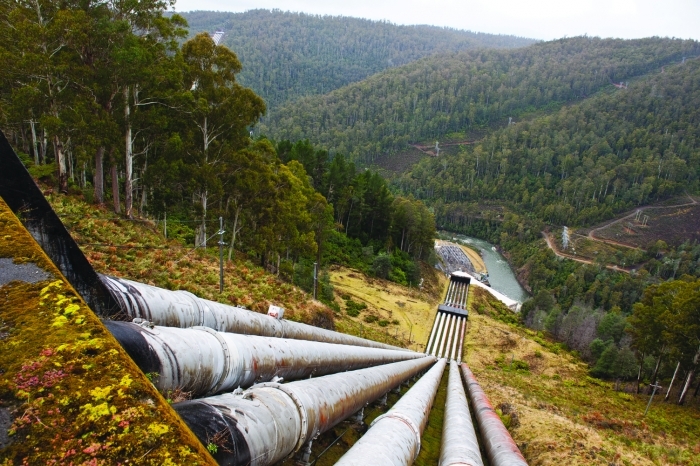 Momentum is owned by Hydro Tasmania, Australia’s largest generator of renewable energy and the nation’s largest water manager. Momentum’s values include putting people’s health and safety first; behaving with honesty and integrity; working together, respecting each other and valuing diversity; being accountable for their actions and creating a sustainable future. “Our commitment to customers and excellent service matches the superior performance associated with smaller providers,” reads Momentum’s website. As a major company employing thousands of people, Momentum has a vital need to keep everyone on the same page. Before CrownTV stepped in, Momentum was using paper noticeboards for its internal communications needs. Those noticeboards, however, were not getting noticed. “We wasted a lot of paper and people tended not to pay attention to them because they were cluttered and stagnant,” Leigh Meagher, Momentum’s Internal Communications Manager, told CrownTV. In addition, Momentum’s busy team lacks the time to absorb content other than core business information while at their desks. And how did CrownTV size up? “CrownTV met all of our needs perfectly,” said Leigh. Momentum’s new digital noticeboards, as they call them, “are a great way to keep people informed of what’s happening in our workplace community,” Leigh told us. Momentum uses its digital signage screens to remind staff of the company’s values. Momentum mainly displays video, graphics and their custom-branded templates. In the future, they plan to display Instagram and Twitter to keep staff informed of what customers are saying about the company. A staff announcement made using a custom-branded template designed by CrownTV. 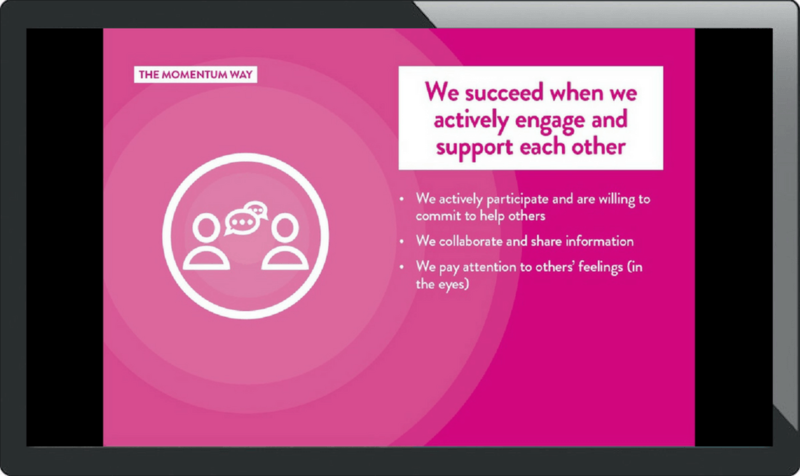 Momentum makes great use of video, displaying content like interviews or highlight reels from recent internal events. The videos serve as previews driving employees to watch the full videos on Momentum TV, the company’s internal video platform. The graphics and video Momentum displays are all on-brand, helping the company achieve internal branding. It also gets employees engaged by immersing them in the Momentum brand and keeping them informed of the company’s latest doings. The content is easy and quick to absorb, all throughout the office. “People can absorb small amounts of information each day while making a cup of tea or eating lunch,” said Leigh. Digital signage has led to better circulation and consumption of information at Momentum’s physical locations. Their employees are more informed than ever, thanks to how efficient it is to both distribute and take in information on digital screens. According to Leigh, Momentum has experienced “More informed and engaged staff, less cluttered walls and better content,” since switching from paper to digital noticeboards. Momentum’s staff are fans as well. “We’ve received a lot of positive feedback from our staff who really enjoy the new way of communicating,” Leigh told us. Momentum knows energy, and not just the kind that comes from wind or water. 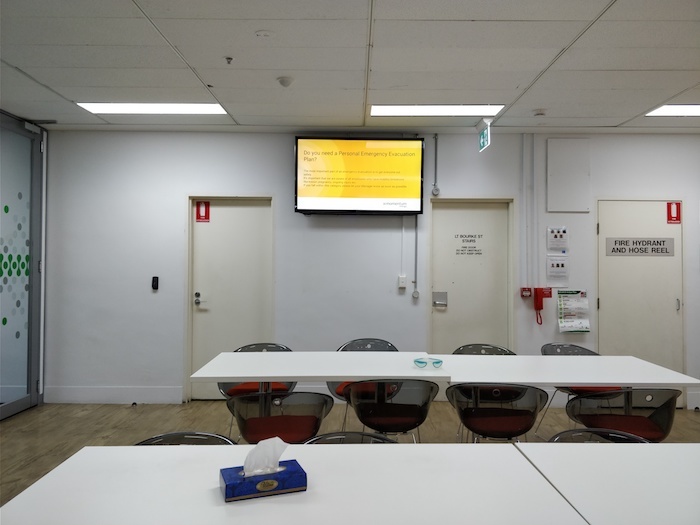 They’ve harnessed the power of digital signage to create a communicative energy, all the way in the land down under. Contact CrownTV for a free demo and to discuss how we can help you emulate Momentum’s internal communications success through digital signage.